The XSPEC Apec models - such as xsapec, xsbapec, xsbvapec and xsvapec - default to using version 2.0.2 of the AtomDB atomic database. To use a different version you need to change the value of the APECROOT variable used by the XSPEC model, using the set_xsxset command, as described elsewhere. and all XSPEC Apec model components will use this version of the database whenever they are evaluated (e.g. in fitting, error analysis, calculating statistics or plotting). 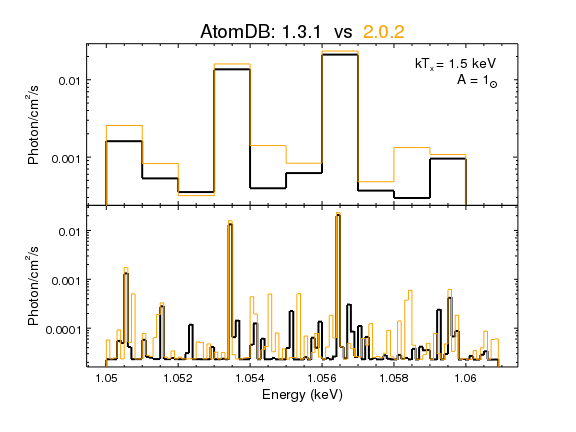 In the following script, we show how you can compare the values from the xsapec model for versions 1.3.1 and 2.0.2 of the AtomDB. The choice of energy range and model parameters made here was for didactic reasons rather than to highlight any specific feature in the new database. # of each bin for the model evaluation. The set_xsxset call to change the APECROOT value needs to be made each time Sherpa is used (analagous to how changes to the XSPEC abundance setting, using set_xsabund, must be made each session).